When buying sofas, the best choice that you would be getting would be sectional sofas. This kind of sofas provide you a more modern look and also help you in getting over the monotony of the traditional sofas. Not only this, these sofas are more functional and more comfortable as well. Hence, you must always check them out while visiting a furniture store. There is a great variety of this furniture available in the stores and it is certain that you would be able to buy one for yourself as well. If you have decided to bring one of these sofas home, then follow these three simple steps and get only the best at your favorite furniture store. First of all, think about the space. You need to be very careful with the dimensions of the room that the sofas would be placed in, the exact position of the sofa, the places of other furniture items etc. There are two shapes available in sectional sofas, namely L-Shaped and C-Shaped. The L-Shaped sofas are generally used for bigger rooms with ample of space. Most of these sofas are considered ideal for rooms that have a rectangular dimensions. On the other end, there are the C-Shape sofas that would suit smaller or circular spaces more. Before buying anything for yourself, you must always look at the amount of space you can free up for the sofa as well as the shape and size of the sofa that needs to be placed in the room. Consider the fabrics with which the sofa is made. With sectional sofas, you need to be especially careful with the fabrics. They must not only look beautiful, but must also be durable and strong. The look and design of the fabric can change with the kind of furniture setting that you have opted. However, the strength of the material must never be compromised with. The cheaper furniture comes with weaker material which will wear out with ease. So make sure that you don’t have to give up on quality. If you buy better quality sofas, the fabrics and upholstery would outlast your expectations and the look would also be preserved for long. Finally, you need to pay attention to the cost of the sofa. You have to buy something that gives you proper quality at reasonable prices. 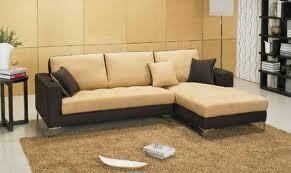 Do not opt for a cheap quality sofa just because it is available in the furniture store for a lesser cost. Similarly, don’t buy a piece that has been overpriced. In both the cases, you would not be getting the desired value for your money. One of the best ways to find the rightly priced sectional sofa is to look for the exact measurements and fabrics used. Knowing these dimensions would help you in buying only what you need. Sit on the sofa and see if it provides you comfort or not. Doing this would help you in paying only a reasonable amount for your sectional sofa and also promise exclusive comfort to the users.